Explore these plus-size sale dresses to find designer dresses at budget-friendly prices for prom, homecoming, or any special occasion. Savvy shoppers will delight in the variety of styles, designs, and trendy features found in this plus collection. 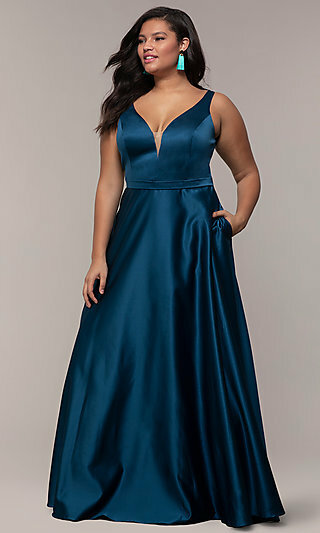 You will find cheap formal gowns in plus sizes accented with gorgeous beading and jewels, short plus-size party dresses on sale, as well as fully sequined plus-size cocktail dresses with alluring cut outs and trendy sleeves. From chic and unique plus-size print dresses to elegant discount evening dresses in plus sizes, Simply Dresses has a plus sale dress to help you achieve that elite look for less. 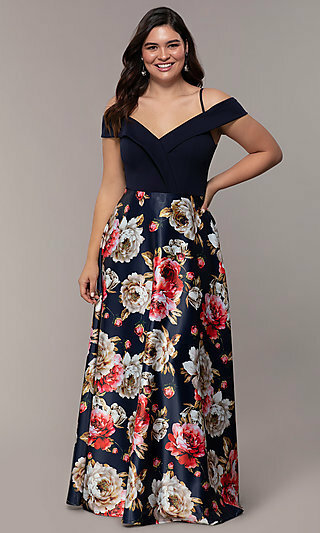 Where Can I Find a Trendy Plus-Size Dress on Sale? Shop this collection of cheap designer dresses in plus sizes to find a trendy style for your next big event. Try a curve-hugging prom plus dress with a ruched bodice and floor-length skirt to portray a graceful vibe. To showcase your trendsetting style, slip into an off-the-shoulder discount evening dress or plus formal gown with an illusion lace bodice for a stylish look. If you prefer more fun and flirty styles, try one of the short plus-size shift party dresses or cheap evening dresses with a stunning open-back design or alluring cut outs. Paint the picture of pure poise and grace as you make a grand entrance in a floor-length plus-size evening gown with finely detailed embroidery or floral appliques. Whatever your personal style, let it shine without breaking the budget in one of these cheap dresses in plus sizes. As you browse this assortment of designer plus-size dresses on sale, you’ll notice a blending of fashion-forward styles with functional features to create dresses that are comfortable and stylish. A corset lace-up back is not only beautiful, but also adjustable for comfort and convenience. A knee-length plus-size halter dress will provide ample coverage and support, ensuring you can dance the night away. A fashion-forward plus-size party dress featuring a daring keyhole cut out works to draw attention upwards and elongate your overall silhouette, as does a high-low style or plus dress with a unique neck or hemline. You’ll save time and money when you shop Simply Dresses for all of your plus-size dress needs.